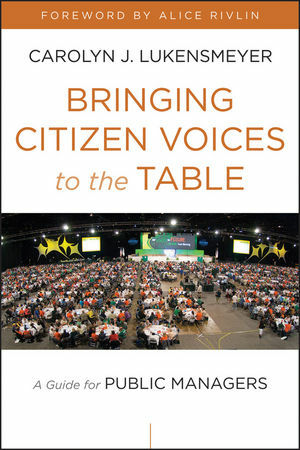 Carolyn Lukensmeyer has published Bringing Citizen Voices to the Table. Carolyn is Executive Director of the National Institute for Civil Discourse and founder and former President of AmericaSpeaks. She also has extensive experience in state and federal government. Her book distills the lessons of her career into seven strategies that can be adopted by public managers at all levels of government. If they implement these strategies, it will strengthen our democracy. I know of no other book that provides the same recipe, and it is grounded in general principles and evidence plus compelling case studies and examples. Carolyn also argues for large-scale policy changes that would enable public managers and the public to use the strategies that she recommends. Most of the book is analytical and dispassionate, but she incorporates autobiographical material that will make it more approachable for practical readers. In places, it is quite moving. The most immediate audience is public managers, from city managers and planners and school district superintendents to state and federal agency officials. Another large audience consists of people who may be considering becoming public administrators, especially graduate students of public administration. Organizers of deliberative democracy should also read it, and it deserves an international audience, because the same strategies have also been tested in other countries–and in some cases, are better supported overseas. Call 800-356-5016 and use Promo Code CL252 to save 36% on the cover price of the book.